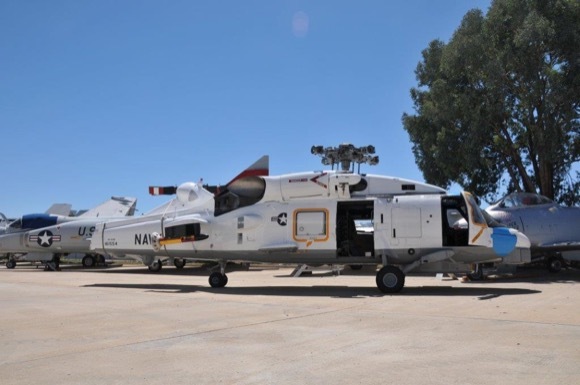 El Cajon, Calif. -- The San Diego Air & Space Museum has a new addition to its already impressive collection of aircraft at the Museum’s Gillespie Field Annex in El Cajon east of San Diego, courtesy of the United States Navy. 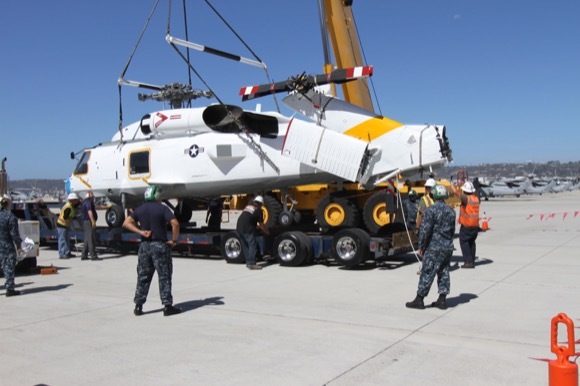 On Wednesday, August 5, 2015, the Museum, with the help of A&D Logistics, trucked a retired SH-60B Seahawk helicopter from North Island Naval Air Station – the birthplace of U.S. Naval aviation – to the Museum’s Annex at 335 Kenney Street in El Cajon. 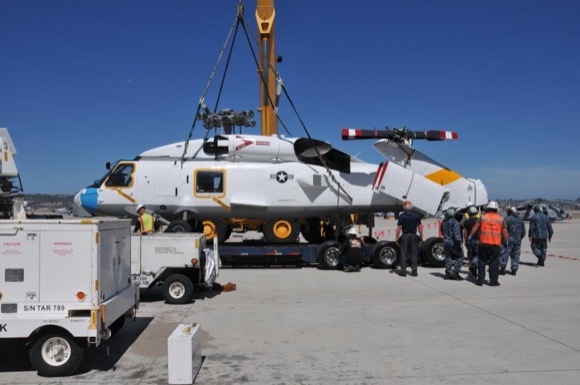 The Seahawk was originally one of three prototypes of its kind built by Sikorsky for the Navy. After 30 years of service, the helicopter was sitting unused at North Island. 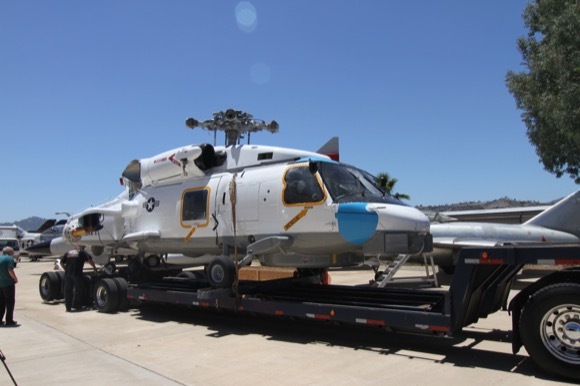 After agreeing to loan the Seahawk to the San Diego Air & Space Museum, the Navy restored the helicopter, including painting it to its original markings from when it was delivered to the Navy by Sikorsky. 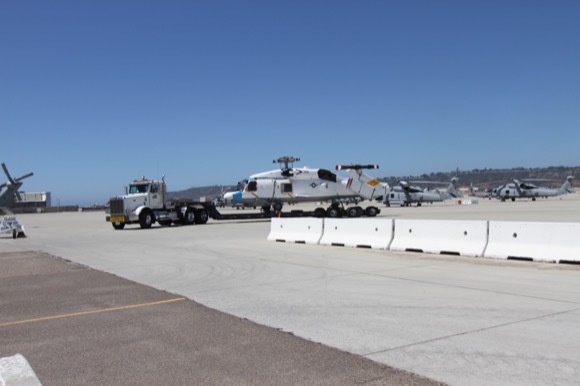 The helicopter will remain on loan to the San Diego Air & Space Museum for an indefinite period of time. To get from North Island to Gillespie Field, the helicopter had to be trucked through popular and crowded San Diego city streets and freeways. Too heavy to go over the iconic Coronado Bridge, the helicopter left North Island Naval Air Station via the 4th Street exit and turned right on Alameda Avenue. It was then taken south on the Silver Strand to Palm Avenue, through Imperial Beach, before heading north on I-5. A quick trip on Highway 54 to the 125 led the truck carrying the helicopter to Santee, where it left the freeway before heading down Kenney Street to the Museum’s Annex on the north side of Gillespie Field. In all, the trip lasted about one and a half hours. • The Navy SH-60 series was based upon the Army Black Hawk, modified for the Navy use with look down radar, hard points for torpedoes, sonobuoy, air to surface missiles, and guns. • Engines, weapons, accessories and electronic surveillance components have been removed and the helicopter has been completely de-milled. On Thursday, August 6, the Museum’s curatorial staff attached the helicopter’s main rotor blades, which traveled from North Island to Gillespie Field on a separate trailer. The helicopter is now on display to the general public. The helicopter’s voyage from North Island to El Cajon was chronicled by several television news stations in San Diego, including notably by FOX 5 San Diego and CBS News 8. To view video from the news coverage, click on the links below. The Museum’s Gillespie Field Annex is generally open Monday, Wednesday, Thursday and Friday from 8:00 a.m. to 3:00 p.m. The Annex is located on the north side of Gillespie Field. Please call (619) 258-1221 for more information. Admission is free but donations are accepted.